The Viewtalay 1 residence is the oldest (approximately 20 years old), the most popular and the most convivial of all our residences. It does not have less than many assets like its splendid swimming pool, a guarding 24/24 coupled with a video surveillance and a remarkable maintenance. "Sweet" prices, its location 5 minutes walk from the beach and the passage of public taxis make it the most popular. With its shops (bars, restaurants, laundries, minimarkets, etc ...) it is the most convivial Viewtalay residences. The ViewTalay 1 residence is located about 600 meters from the beach, next to the bus station for Bangkok Airport. The Viewtalay 1 apartments range from a well-equipped 31 m2 studio, but without a kitchen, with a small balcony to 64 m2 suites with a separate bedroom. For an economical and friendly holiday, this is really the ideal place. Pool ViewTalay 1, this pool is reserved for the occupants of the building. We offer a studio of 31 m2 at a first price at Viewtalay 1. Nice apartment of 64 m2 with large separate bedroom, open view. (7th floor). 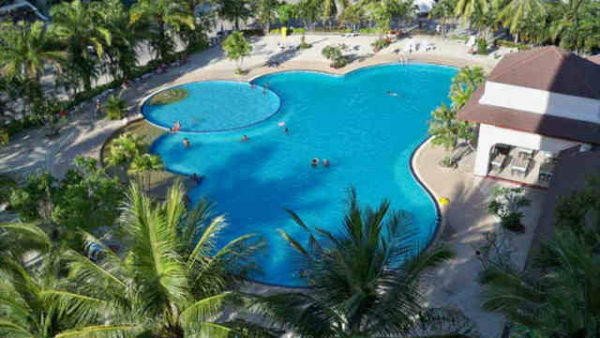 Security 24h / 24, taxis, very large pool, restaurants, supermarket, laundry, large parking, bank, rental car and motorcycle. All comfort: balcony, air conditioning, cable TV, DVD player, 1.90m bed, lounge, dining area, refined decoration. Rates per month low season: 11,900 baht, high season: 18,600 baht. Apartment.